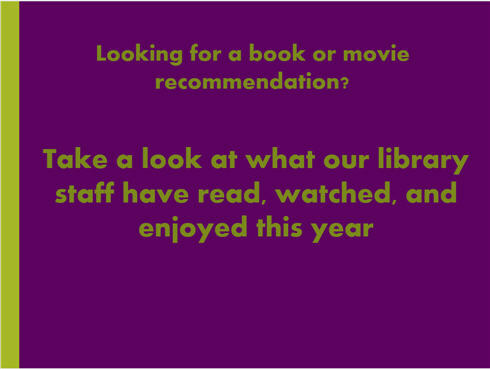 What have the library staff been reading and watching this year? Curl up with a good book or movie over winter break! Durham Tech has a lot of partners that help provide a wide range of services and access to information. One of those partners is UNC Chapel Hill’s North Carolina Digital Heritage Center (http://www.digitalnc.org). The Center’s mission is support “community engagement and lifelong learning by promoting and increasing access to North Carolina’s cultural heritage.” This includes helping libraries like Durham Tech’s library digitize information, which increases access to the materials. 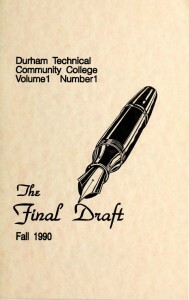 Materials from Durham Tech can be viewed here. Publications include course catalogs, yearbooks, annual reports, and issues of The Final Draft. You can browse their collection by contributor, county, and item type as well as search by keyword. Without the help of the Digital Heritage Center, Durham Tech would not be able to make these publications as easily available online, and we appreciate their work helping us and other organizations make these materials more easily accessible to a wider audience.